You have been asked to troubleshoot WAN connections for a local telephone company (Telco). The Telco router should communicate with four remote sites, but none of them are working. Use your knowledge of the OSI model and a few general rules to identify and repair the errors in the network. a. Examine the Addressing Table to determine the location of the DCE connections. b. Each serial connection has a DCE and a DTE connection. To determine if each Telco interface is using the correct end of the cable look on the third line of output following the show controllers command. c. Reverse any cables that are incorrectly connected. Note: Cable between Telco and R4 should be reversed and clock rate set on Telco. Serial Cable on R4 should connect to S0/0/1. Note: In real network settings, the DCE (which sets the clock rate) is typically a CSU/DSU. Step 2: Diagnose and repair incorrect port connections. a. 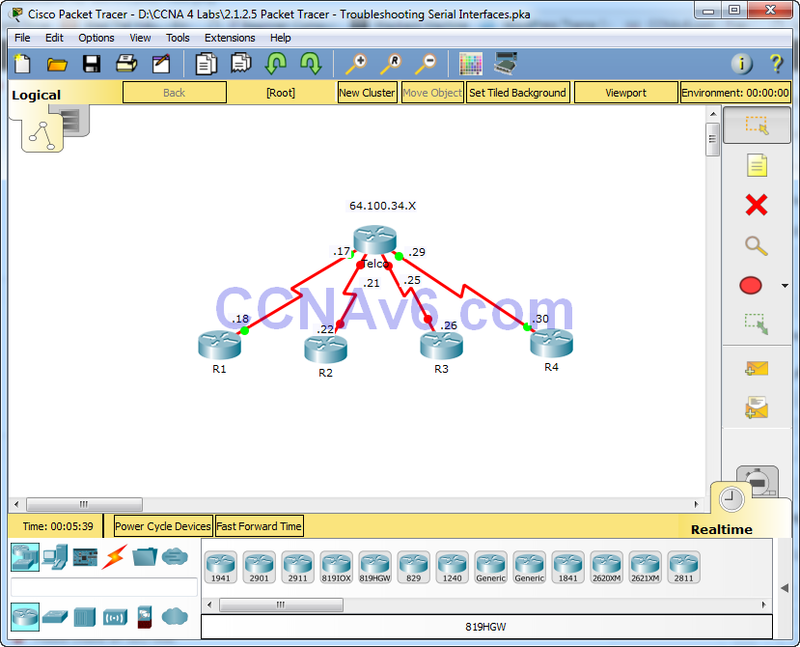 Examine the Addressing Table to match each router port with the correct Telco port. b. Hold the mouse over each wire to ensure that the wires are connected as specified. If not, correct the connections. Step 3: Diagnose and repair ports that are shutdown. a. Show a brief interface summary of each router. Ensure that all of the ports that should be working are not administratively down. Step 1: Examine and set clock rates on DCE equipment. a. All of the DCE cables should be connected to Telco. Show the running configuration of Telco to verify that a clock rate has been set on each interface. Step 2: Examine the encapsulation on DCE equipment. a. All of the serial interfaces should be using HDLC as the encapsulation type. Examine the protocol setting of the serial interfaces. a. Show a brief interface summary of each router. Check the IP addresses against the Addressing Table and ensure that they are in the correct subnet with their connecting interface. Step 2: Verify connectivity between all routers.